This summer, the TTC will rebuild the special work at the intersections of Broadview with Dundas and with Gerrard, as well as replacing the tangent track between these two locations. Minor repairs are also planned between Gerrard and Danforth. This post will track the progress of the work. As of August 9, the TTC has announced that the intersection will reopen to traffic and normal routes for 504 King, 505 Dundas and 506 Carlton will resume on Sunday, August 12 at 7:00 am. By the fourth day of the project, the old intersection had been demolished and the new concrete foundation was nearly ready for the new track. On day seven, the intersection is fully in place, and work is in progress on various connecting tracks. These photos illustrate the first stage in replacing track that was built with the now-standard three-layer technique. At the bottom is a concrete slab, and in the middle layer are steel ties with mount points for Pandrol clips that hold the rail in place. The top layer of concrete goes from the top of the ties to the rail head. In the first photo below, the machine is cutting away the concrete between a pair of rails to the depth of the first layer and throwing the spoil into a dump truck. The second photo shows the resulting structure with the rails still in place, but only a narrow band of concrete on either side. In the third photo, the remaining concrete is broken away from the track. The photos below work north from Dundas Street. In some of them, the old track has been removed while it others it remains in place. The last photo shows the result after the track is removed with the connection points for the Pandrol clips exposed but not yet cleaned up for new track installation. The photos below show the progress of attaching new rail strings to the pre-existing structure. In the first and second photos, the attachment points for the Pandrol clips are exposed, but the rail strings have not yet been placed. In the third photo, the rail is positioned on the ties, and the rubber vibration insulation has been placed around the rail. In the fourth photo, the clips have been installed locking down the rails. In the fifth photo, covers have been added over the clips, and concrete work (in the foreground) has already begun. A gauge bar is used to verify the rail spacing. Although the attachment points for the clips effectively dictate the gauge, there is a bit of play, and the rail is checked and adjusted if necessary before the concrete pour. In the sixth photo, the concrete pour is underway north from Dundas. Demolition of the old intersection at Broadview & Gerrard is well underway. Work began on July 24. Most of the concrete foundation is in place ready for track to arrive. 2018.07.29 A stock of steel ties awaits installation. The central diamond had been placed and part of the southern quadrant was roughly in position when I visited about noon. The diamond is unusual in that it is not a 90 degree crossing, and there the curve coming out of the east side begins within the diamond itself. Also, the intersection slopes from south to north. At midday, the intersection was almost completely assembled with only the approaches still in progress. The City of Toronto tweeted yesterday that the intersection work is ahead of schedule and should open on August 20. The assembly of the intersection will likely take the balance of the week through to August 4, and then there are the connection tracks to the adjacent structures. Once concrete is placed, it would be about a week before before traffic could return. This has now been announced for August 12. 504 King and 505 Dundas buses have shifted to use the roads connecting to Gerrard at St. Matthews. 506 Carlton buses divert via River, Dundas and Logan both ways. When the intersection reopens to traffic, the replacement bus service will operate on the normal route. Streetcars return to 504 and 506 on Sunday, September 2. The TTC has confirmed that although the Board approved addition of a north-to-west curve at this location back in 2010 (along with other changes), corporate amnesia caused this to be omitted from the current work. Updated May 18, 2018: Photos added. The first of three intersection renewals on the Carlton and Dundas routes began on May 14 at Gerrard and Parliament Streets. Intersections at Broadview/Dundas and Broadview/Gerrard will follow in June and July, as well as track renewal on Broadview between Dundas and Gerrard. Planned renewal of the track from north of Gerrard to Hogarth (the north end of Riverdale Park) has been deferred to a future year, as yet unknown. Demolition of the intersection began on the morning of Monday, May 14, and by late afternoon Wednesday, May 16, the new foundation was in place and ready to receive track. I happened to drop by just as the first track panel was being unloaded and placed in the street. Intersections are pre-assembled at Hillcrest before they are delivered to the site so that they can be installed in panels rather than individual parts, a much more labour intensive process once used by the TTC. Preassembly also allows pre-welding of all components in one panel, and the only on-site welding required is to join panels to each other and to odd pieces of track that individually complete the junction and approaches. At the time of my visit in the early afternoon, the south quadrant had been installed and assembly of the middle of the intersection was in progress. As of mid-day, most of the north-south trackage is in place including the run off tracks that will link to the existing track beyond the work site. Welding was in progress. The eastern quadrant appears ready to receive its track panels. The intersection is now almost completely assembled. Concrete work will follow in two separate stages: one to the height of the ties, and another to the railhead. This arrangement makes repairs easier because only the top layer needs to be demolished. Based on feedback from readers, I have experimented with alternative presentations of the data that better illustrate what is happening on the route. These versions will be added to the repertoire of charts I will use in future analyses, notably for the 505 Dundas route which is the next one in line for review. Addition of two AM peak “gap trains” on 1 Yonge-University-Spadina and other operational improvements. An update to the schedules for service on the King Street Pilot to reflect the improved travel time on the street and to reduce vehicle queues at terminals. Changes to all routes serving Main Station during construction that will close the loop to transit vehicles. Diversions of the Parliament and Carlton routes around track construction at Gerrard & Parliament. Changes to Don Mills bus schedules to reflect actual operating conditions and Crosstown construction effects. Seasonal changes to reflect declining ridership to post-secondary institutions during the summer. Summer improvements including extension of 121 Fort York Esplanade to Cherry Beach during all operating periods, improved weekend service on 92 Woodbine South, and later service to the Zoo. There is a new summer route 175 Bluffers Park on weekends between Kennedy Station and the park’s parking lot. Service cuts and running time reductions on 6 Bay. Weekend reliability improvements on 96 Wilson and 165 Weston Road North. Weekday reliability improvements on 199 Finch Rocket. Two “gap trains” will be added to the morning peak schedule to provide additional service as needed southbound on Yonge. One train will be stationed in Eglinton pocket track, and the other on the hostler track at Davisville. Trains leaving service in the evening to Wilson Yard will now do so southbound from Vaughan rather than northbound at Wilson. This avoids conflicts between the yard movements and southbound service. Running times on 504 King will be reduced during almost all operating periods, and the saving will be converted into slightly shorter scheduled headways with no change in total vehicles. The four peak period ALRV trippers will be replaced by six CLRV trippers. Flexity cars will now be formally scheduled to cover part of the service with priority going to runs that stay out all day. 514 Cherry service will be improved during the AM peak, weekday early evening, Saturday afternoon and Saturday early evening periods by the addition of one or more cars. Peak period crewing practices will be changed to step back operation to reduce terminal delays. 20 Cliffside and 62 Mortimer will be interlined as a single route from Broadview to Kennedy Station. 23 Dawes will be extended west to Woodbine Station. 64 Main will be extended north to Eastdale. 87 Cosburn will loop on street via Danforth and Chisholm. 113 Danforth and 135 Gerrard will be cut back from Main to Victoria Park Station. 506 Carlton will be extended east to Victoria Park Station via Gerrard covering the mileage of the shortened 135 Gerrard route. 65 Parliament will divert via Sherbourne between Dundas and Carlton. 506 Carlton will divert via Dundas between Sherbourne and River. Service on 6 Bay will be reduced by the elimination of one or two buses during most operating periods, and headways will be widened as a result. This route suffers from excessive running time as shown in a previous analysis I published, and I will be updating this with current data in May. Updated April 24, 2018 at 6:15 am: The axis title on the headway history chart at the end of this article has been corrected from “Minutes” to “Seconds” to reflect the units by which headways are stated in the chart. In Part I, I reviewed the travel times for buses and streetcars on 506 Carlton since September 2017. In Part II, I will turn to headway reliability – the degree to which service actually operates with evenly spaced vehicles – as well as the capacity of service provided. A followup section looks back to September 2015 to compare operations over a longer timespan. Results are consolidated for entire days and months so that variations are smoothed out, and the raggedness both in hour-to-hour and day-to-day performance is hidden. Relatively poor performance in peak periods can be masked in averages by better performance in the off-peak. Even though there are fewer off-peak vehicles, there are more off-peak hours and hence more trips. There is no measure of service quality except at terminals even though that is not where most riders use the service. The absence of mid-route measurements means that there is no penalty in a missed “target” for line management quality over the length of a route. The six-minute window (+1 to -5) allows pairs of vehicles on routes with short headways to depart from terminals while still being considered “on time”. Route capacity is wasted because some vehicles run half-empty close behind their leaders, and the average rider experience is that vehicles are infrequent and crowded. The TTC has no metric to identify and monitor this problem. Service on 506 Carlton has been erratic for many years and the shift to bus operation in February 2018 has not improved route performance. 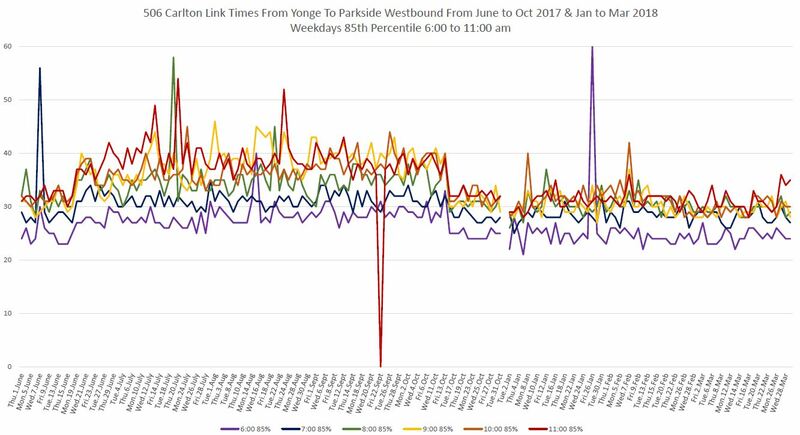 Although buses are scheduled closer together for capacity reasons, headways remain erratic and in some cases the variation in headways has widened since the move to bus operation. Looking at these charts, it is a wonder that anybody tries to ride this line at all. It is a textbook example of providing bad and slowly declining service on what was once a trunk route in the system. As density builds up along the “shoulder downtown”, routes like Carlton have an important role, if only the TTC would make the effort to provide more attractive service. 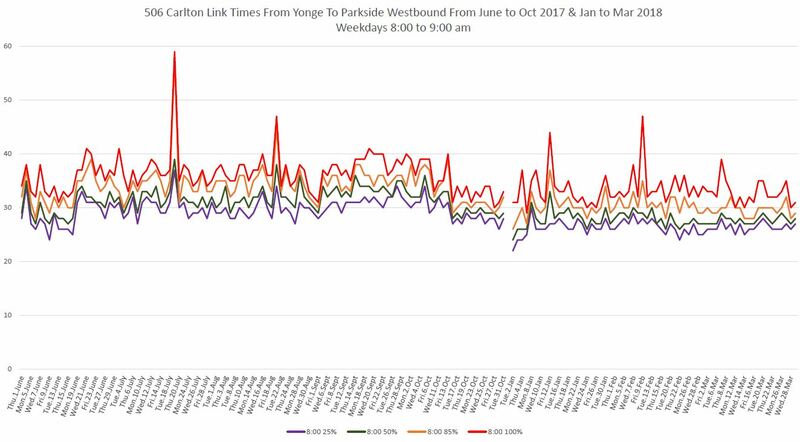 Updated April 23, 2018 at 9:30 am: A section has been added following the original article to discuss travel times over the full route from Main Station to High Park including weekend data. With the temporary conversion of the 505 Dundas and 506 Carlton routes to bus operation for much of 2018, there is a chance to compare how these routes operate with each vehicle type. In this and future articles, I will review travel times across the routes as well as headway reliability. Data for 506 Carlton that I have collected runs from June to October 2017, and from January to March 2018. For the purpose of speed comparisons, weekdays from January 8-19 (streetcar) and March 19-28 (bus) 2018 are used. This avoids major storms as well as periods when schools were closed and traffic was lighter than normal. There are seasonal variations in travel times due to the nature of streets and neighbourhoods transit services run through. As the year progresses, it will be possible to compare data for warmer months when the streets are busy between 2017 and 2018 data, although this must be tempered with the effect of diversions that were in effect during 2017. There is a slight improvement in travel time at certain periods of the day and certain locations/directions for buses, but this is not large or widespread even in off-peak periods. Buses tend to reach higher peak speeds between stops where conditions permit, but in many cases the speed profiles are comparable for the two modes. Bus headway reliability has been a topic of some discussion on Twitter along with the capacity of the replacement service, but I will turn to those issues in the second part of this analysis. The 506 Carlton route changed from time to time over the past year, and this affects the travel times reported here. June 18, 2017: Service diverted via Dundas and Bathurst both ways for streetscape work on College. This increases travel times on the west end of the route starting in mid-June. June 19 to July 9, 2017: Service diverted via Queen between Parliament and Coxwell for construction on Gerrard. July 10 to 25, 2017: Service diverted to Coxwell-Queen Loop for construction on Upper Gerrard. Bus shuttles provided service east of Coxwell. July 26, 2017: Service returned to Main Station. West end diversion via Dundas continues. October 14, 2017: Service resumes standard routing. February 18, 2018: Conversion to bus operation. Western terminus extended to High Park Station. The charts presented here are similar to those I have used in previous articles with some minor changes. In the chart sets containing percentiles of travel time values, there are three groups of charts. The first three pages show the 85th percentile values by hour through the day. Most trips fall within this range, and using the 85th percentile shaves off the worst of the peaks. The next three pages show the 50th percentile values by hour. The format is the same as in the first group, but the values are the medians – half of the trips take longer, and half take shorter. The last four pages show four percentiles from 25th (only 1/4 of trip take this time or less), 50th (median), 85th (most trips) and 100th (maximum values) for four one-hour periods through the day representing the am peak, midday, pm peak and early evening. Travel times in the summer (until Thanksgiving weekend) were longer than in the fall and winter. Some of the highest values fall not in the AM peak but in the late morning. Where there is a spike up, this indicates a delay severe enough to push the 85th percentile to a high value. Where there is a spike down to zero, there was no service over thr route section and direction during the hour in question (for example below, on September 22 between 11 am and noon). Data are grouped based on the hour when a vehicle enters the section being measured, in this case crossing Yonge Street westbound. The charts with the four percentile bands give a sense of the range of values. At the low end, the 25th percentile (purple) gives a sense of the best case times as only one quarter of the trips achieve this time or better. At the high end, the 100th percentile (red) shows the maximum that can occur. This might only be one vehicle or it could be several. The space between the lines gives a sense of how spread out the values are. The charts showing average speeds are organized differently to show vehicle behaviour over the length of the route. There are 20 pages to each set of charts, one for each hour from 6-7 am to 1-2 am. To allow the charts room to “breathe”, the data are split into the east and west half of the route divided at Yonge Street, and there are separate chart sets for westbound and eastbound travel. Westbound charts should be read left to right. Eastbound charts should be read right to left. 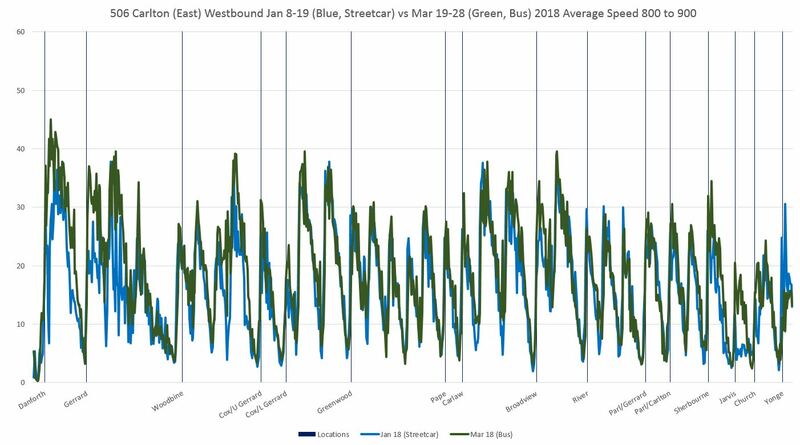 To the degree that the blue (streetcar) line hangs below the green (bus) line, this shows areas where streetcars travel, on average, more slowly than buses during the hour in question, averaged over the period. Where the blue line rises above the green line, the streetcars are faster. One can get a sense of the evolution of travel times for both modes over the course of the day by stepping through the pages to view the rise and fall of values. Late at night, the number of vehicles in service falls, and with that the number of data points. Charts for the period from 1-2 am have less granularity as a result. Methodology: From the tracking data, we know where each vehicle is every 20 seconds, and from this can derive the speed at that location and time. The route is subdivided into 10m segments, and the calculated speeds are allocated to wherever the vehicle is observed at a given time. The total is then divided by the number of observations to produce average speeds. The downward notches in the charts correspond to places where vehicles stop, or at least slow, typically on the approach to a transit stop or signal. Not all trips stop at all locations, and so a non-zero average can result. Where the downward “notch” approaching a stop is wide, this indicates vehicles queueing on the approach due to congestion. The total number of weekly hours of regular service planned for the June board period will be approximately 2,600 hours below the level specified in the planned 2017 Service Budget for June (August 3, 2016 version). This is a result of current bus and streetcar fleet limitations as well as deeper summer cuts than originally budgeted for. To put this number in context, the budgeted hours were 175,410 compared to the schedule hours of 172,807, a reduction of about 1.5%. Scheduled hours to deal with construction-induced delays and diversions are also down from a budget of 38,022 to actual of 24,365 over the first half of 2017. This translates to savings partly in the Operating Budget (costs the TTC absorbs itself), the Capital Budget (service operated to deal with projects like the TYSSE) and recoveries from other parties. At some point, the fleet limitations will cease to be a valid explanation for service levels, and the TTC will face increased costs simply to operate the service its own standards dictate. Worth watching for will be the fall 2017 schedules and the degree to which the summer cuts are actually restored. TTC’s recent mixed messages complain of lower ridership while observing that service on some major routes is well below the level of demand. The rider challenge for this summer will be to figure out where all of the streetcar services are actually running. 501 Queen continues with bus operation over the entire route due to various construction projects. Streetcars will return to parts of the route in stages through the fall, but will not operate over its full length from Neville to Long Branch until January 2018. Streetcar service resumes between Connaught (Russell Carhouse) and Roncesvalles in September. Streetcar service will return to Neville in mid-October, but there will be a diversion around trackwork at McCaul & Queen until late November. Streetcar service resumes west of Roncesvalles in January 2018. 502 Downtowner remains as a bus operation at least until mid-fall. 503 Kingston Road Tripper will continue with streetcars in June/July, but will revert to bus operation thanks to construction at Coxwell & Queen later in the summer. Construction on Wellington requires a continued extension of the route westward to Spadina. 505 Dundas will continue its diversion via Bay, College, Carlton and Church around water main and track construction east of Yonge Street until October. 506 Carlton will have two diversions. Bus shuttles will cover the gaps. In the east, for June/July, overhead work requires a diversion via Queen between Coxwell and Broadview/Parliament (EB/WB). In the west, completion of City roadwork begun, but botched by the contractor in 2016, triggers a diversion via Bathurst and Dundas until October. 504 King, 509 Harbourfront, 510 Spadina, 511 Bathurst, 512 St. Clair and 514 Cherry remain on their regular routes with streetcar operation. Some of the peak period trippers now operated on King are being removed because of the “on-going delivery of new Low Floor streetcars”. The line is still scheduled as CLRV operation although many ALRVs, freed up from 501 Queen, now operate there at all hours. The real question, of course, will be what will happen in the fall when streetcars return to Queen and the ALRVs are not available for King. Moreover, current plans are for the Flexity cars to go next onto 512 St. Clair, and it is unclear just how the growth of the new fleet removes the need for trippers. This ties into plans for a King Street transit priority scheme to go into effect late in 2017. It will be counterproductive for the TTC to cut back in service on 504 King just when better priority might be provided. The yard east of Keele Station (originally named “Vincent Yard” after the former Vincent Loop) has not been used for revenue vehicles for many years, but the shift of all of the T1 fleet to Line 2 BD has forced the use of all available storage. The TTC will shift four trains to Keele Yard, with remaining capacity (the yard extends underground beside Dundas West Station and can hold eight trains) to be used by work cars. Moves to and from the yard will occur at the beginning and end of service providing added maintenance time in the overnight break in service. Each night, four trains will typically return to Keele Yard at around 2 – 2:20 a.m., when crews will run system checks to ensure the trains are safe-ready for morning service. The trains will then leave the yard between about 5:45 – 6 a.m. Currently, the first westbound train is scheduled to travel past Keele Yard at 6:01 a.m. Local residents are likely to hear two short horn sounds – required for safety – whenever a train is about to move inside the yard, as well as the sound of trains moving. Efforts to minimize noise will include ongoing noise monitoring, regular reminders to staff at Keele Yard to keep noise to a minimum, sounding subway horns only when necessary for safety and ensuring that the warm-up periods of subway workcars parked on outside storage tracks is kept to a minimum. If you have a PRESTO card you no longer need a paper transfer. This is because a transfer is applied to your PRESTO card when you first tap onto a card reader. The transfer for your one-way continuous journey is valid for two hours from the first time you tap your card on a reader. Standard transfer rules apply. More extensive descriptions of bus-to-other mode transfers are on the bus Presto page. Again, the rule is that no transfer is required. PRESTO card customers require a paper transfer on the following routes. Transfers must be shown to station staff when entering Union or Royal York stations and to operators when boarding these buses. Please make sure you obtain a paper transfer at the start of your trip. This information does not appear on the pages for the individual routes, nor does it appear on the pages describing fare rules.